This application note is for geologists, environmentalists, petroleum engineers, and others who use soil granulometry as one important parameter for their studies. It demonstrates an example of how the Beckman Coulter LS 13 320 can be applied to granulometry. An academic team used the LS 13 320 to understand the deposition of soil sediments in a Northwestern Chinese mountain range. Soil studies span a range of applications including agriculture, architectural planning, and historical environmental studies3. Characterisation of soils by particle size distribution gives major insight into the deposition history of the sample. Grain size is one of the indicators to understand how soil formed (e.g., fluvial or loess deposits4,5). Fluvial deposits are created from flowing water, including rivers or streams, while loess deposits form from wind-blown silt particles. Sedimentation rate6,7 and sieve analysis7 are two examples of the tools traditionally utilised to determine size distribution of soils. Traditional methods are time-consuming; they each have bias, mostly related to the particles’ shape. Moreover, they require additional tedious calculations to present the results in Phi notation. None of these methods is a direct measurement of soil particle size; all measure a property that is, at best, tangentially related to particle size. Laser diffraction is a superior option for soil sizing7,8. Worldwide, Beckman Coulter laser diffraction instruments are successfully applied in industry and academic research, obtaining close correlation with earlier methods in sizing soils8. The latest instrument in the series, the LS 13 320, yields highly reproducible results—and extremely fast analysis—in Phi notation in a few seconds. Soil samples from the Bogda Mountains in Northwest China were analysed on the LS 13 320. The results were presented by the Department of Geological Sciences and Engineering, Missouri University of Science and Technology (MST). The data were part of a study of mixed fluvial and loess deposits in an intra-continental rift basin, the Mid-Permian Quanzijie Low-Order Cycle. The Beckman Coulter Particle Characterisation applications scientists generated the data in collaboration with MST. 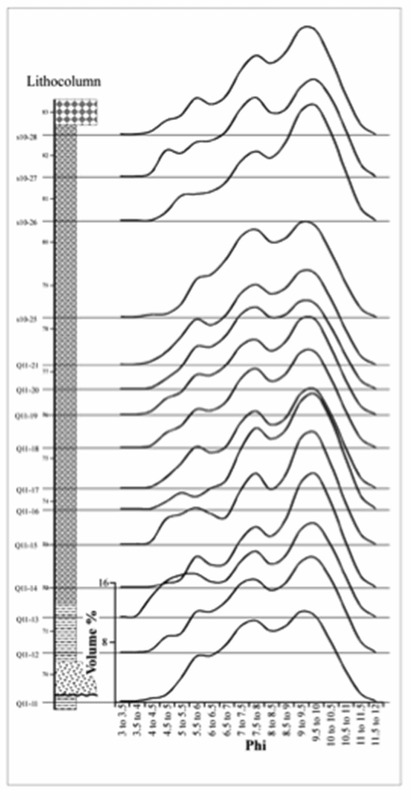 LS 13 320 results supported preliminary interpretation, in support of the hypothesis that massive mudrock of the Quanzijie (QZJ) Formation are loess deposits of an eolian (wind-deposited) origin9. Thirty-one samples from the QZJ were analysed with the LS 13 320 at various locations throughout the basin (Lower, Middle, and Upper). 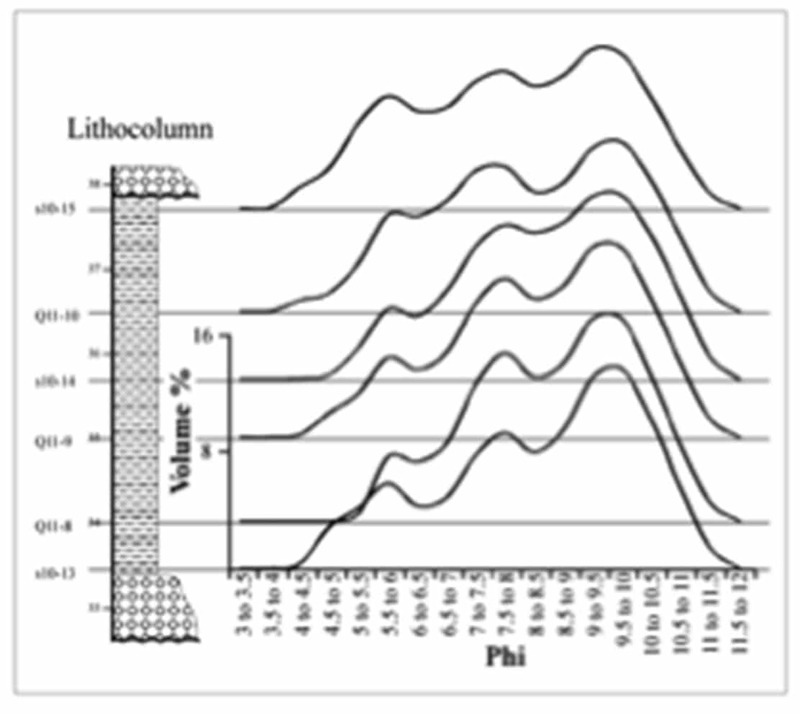 Interestingly, grain size remained roughly homogenous for all samples regardless of lithocolumn (solid depth) location (Figures 1–3). This is consistent with characteristics of wind-deposited materials. In 150 mL beakers, one mL of 1M HCL was added to ~130 mg of each of the samples to loosen and disperse the soils. Approximately 60 mL of DI water and one mL of 10% calgon were added and probe-sonicated for four minutes at 100 W. The preparation beaker was placed into a 500 mL beaker with water to prevent boiling by prolonged sonication. The entire content was added and rinsed into the LS 13 320 Aqueous Liquid Module (ALM) and run with a standard SOP. Results were reported using Folk & Ward Phi statistics and graphs. The LS 13 320 played a vital role in understanding the mechanisms of deposition for soil samples in a Chinese mountain range. The methods presented here have frequently been used around the world in peer-reviewed research publications—such as those presented in the References section—as well as in private industry. Figure 1. Soil Grain Size Distribution Throughout the Lower Quanzijie Lithocolumn. 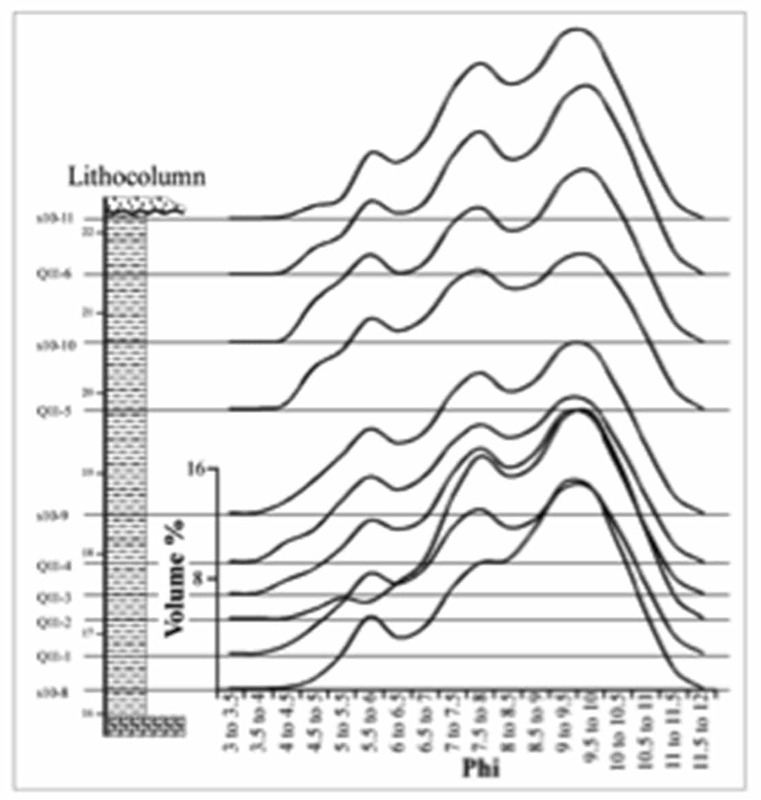 Note the homogenous particle size distribution throughout the column. Figure 2. Soil Grain Size Distribution Throughout the Middle Quanzijie Lithocolumn. Figure 3. Soil Grain Size Distribution Throughout the Upper Quanzijie Lithocolumn. 1. Giller K E et al. Agricultural intensification, soil biodiversity and agroecosystem function. Applied soil ecology. 6.1; 3–16: (1997). 2. Montgomery D R. Soil erosion and agricultural sustainability. Proceedings of the National Academy of Sciences. 104.33; 13268–13272: (2007). 3. Ruiz-Fernández A C et al. Recent sedimentary history of anthropogenic impacts on the Culiacan River Estuary, northwestern Mexico: geochemical evidence from organic matter and nutrients. Environmental Pollution. 118.3; 365–377: (2002). 4. Buurman P et al. Laser-diffraction and pipette-method grain sizing of Dutch sediments: correlations for fine fractions of marine, fluvial, and loess samples. Geologie en Mijnbouw. 80.2; 49–58: (2001). 5. Guo Z T et al. Onset of Asian desertification by 22 Myr ago inferred from loess deposits in China. Nature. 416.6877; 159–163: (2002). 6. Gold T, O’Leary B T, and Campbell M. Some physical properties of Apollo 12 lunar samples. Lunar and Planetary Science Conference Proceedings. Vol. 2: (1971). 7. Konert M, and Vandenberghe J E F. Comparison of laser grain size analysis with pipette and sieve analysis: a solution for the underestimation of the clay fraction. Sedimentology. 44.3; 523–535; (1997). 8. Eshel G et al. Critical evaluation of the use of laser diffraction for particle-size distribution analysis. Soil Science Society of America Journal. 68.3; 736–743: (2004). 9. Obrist J, Yang W, and Feng Q. Mixed Fluvial and Loess Deposits in an Intracontinental Rift Basin, Mid-Permian (Wordian-Capitanian) Quanzijie Low-Order Cycle, Bogda Mountains, NW China. AAPG Annual Meeting, Pittsburgh, 2013.